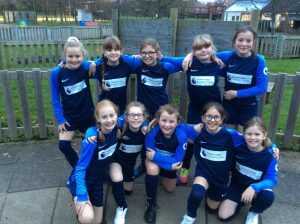 The girl’s football team got off and running with a match under floodlights at Osbaldwick Lane Stadium. Having their first game, the girls did lots of running, passing and tackling. The eventual score was Osbaldwick 2 Dunnington 6. Well done to all the girls. After some training and the recruiment of a goalkeeper Mr Hind and Mr Brown are confident we can get better as the season goes on….watch this space! PLUS we have a new kit which looks very smart.